This is a card that I wanted to make for a long time but never really took the time to make. Finally, I got around to make it! 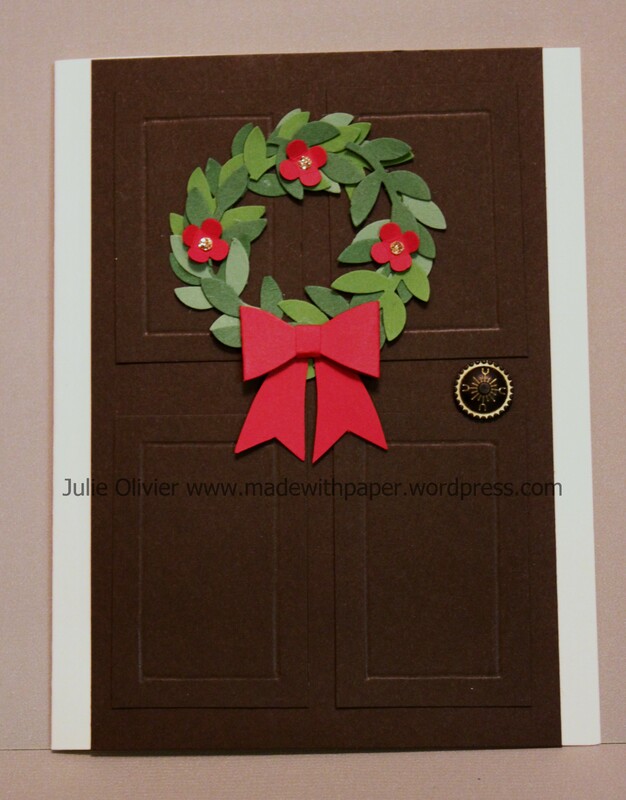 I used the Bird Builder punch to make the wreath (the little branch on that punch). I used 3 different green card stocks: Gumball Green, Garden Green and Wild Wasabi. I added little Real Red flowers punched with the Itty Bitty Shape punch pack and added a small circle in Gold Glimmer paper punched with the Owl builder punch. I made a miniature bow with Real Red card stock. To make the door, I cut 4 rectangles in Early Espresso card stock and scored the lines with the Simply Scored Scoring board and I glued them on a piece of Early Espresso card stock. The door handle is an Antique brad. CS: Very Vanilla, Early Espresso, Real Red, Gumball Green, Garden Green and Wild Wasabi, Gold Glimmer paper. Tools: Build Builder punch, Itty Bitty Punch pack, Owl builder punch, Simply Scored Scoring board. I made this cute penguin as a “name card” for each person for my Holiday Table. It can stand up, holding a candy cane or lay flat as a card. That’s the idea: when guests will arrive, all the little penguins will be standing up at each place around the table, holding a little treat… After everyone sit, they can take the penguin and lay it flat as it becomes a Chirstmas card with a little personal note for everyone inside! To make the body, I used the Top Note Bigz die, in Whisper White, over a Basic Black card stock. I loved the new Mittens punch, so I really wanted to use it!! Now, to make it stand, I used an “easel card” model. I cut a sheet of Bashful Blue card stock in half lengthwise (4-1/4″ x 11″). Then I scored it at 2-3/4″ and 5-1/2″.